A man collects water on Kikuu River in Makueni. - During the dry season, locals dig small wells in the sand like this one to gather water. 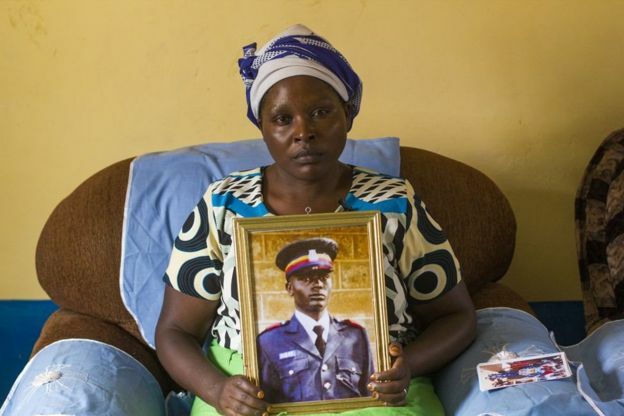 Irene Nduku Kasyoki holds a photograph of her late husband Geoffrey Kasyoki. - His death "pierced my heart," she says. Working on sand. - "[The cartels] oppress us," Mutinda says. "They get the money but we do all the work, and put ourselves in danger doing it." 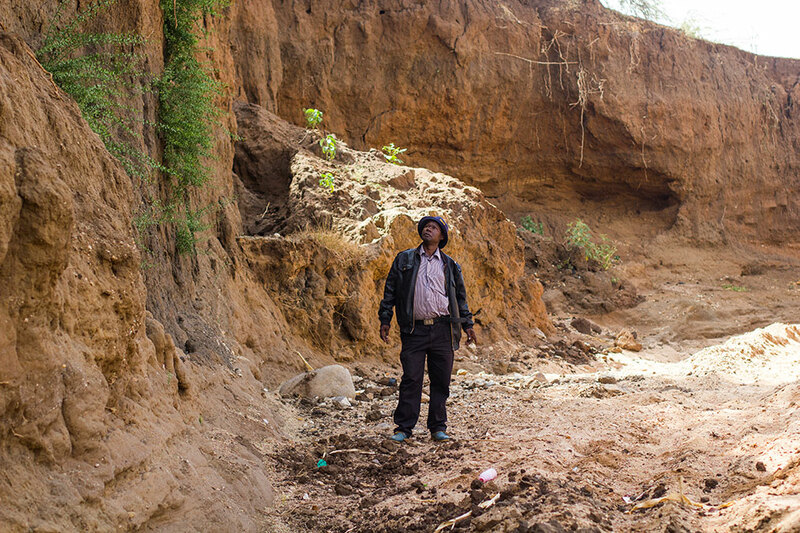 Anthony Mua Kimeu looks at the steep cliffs of the - A couple of years ago, this river was flat; now the drop from the banks to the riverbed is about ten metres. A sand truck in Makueni. 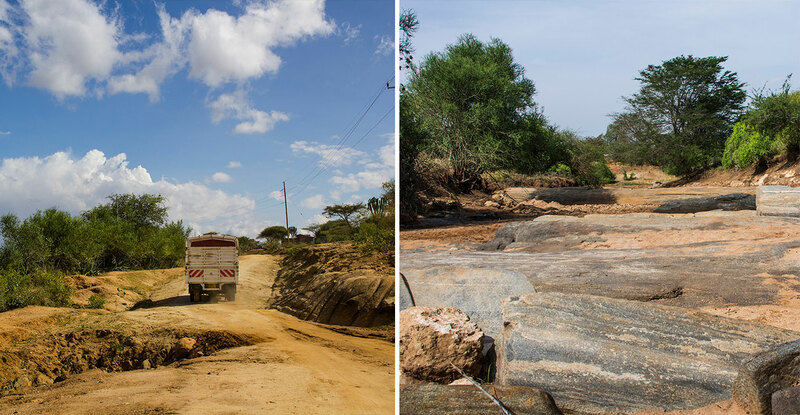 - One kilometre of motorway requires 30,000 tonnes of sand, according to the 2013 documentary Sand Wars by Denis Delestrac.Bedrock signals the bottom of Nthange River's riverbed. Without sand to slow it down, rivers can diverge and travel at incredibly fast speeds over the bedrock during the rainy season. Locals describe it as "like a tsunami", which erodes the land and can sweep away people and livestock. Sand is becoming a necessary component in supporting the construction boom that is driving the rapid urbanisation and economic growth in the country. Sand mining is happening in many places.(5)(6). In the Makueni area Eastern Kenya which has epitomized the extent of the sand wars, up to ten people have lost their lives in the last two years to sand violence.(4). In mid-December 2017 it was reported that three people were killed after a sand mine caved in at Kwa Muvai River, Makueni county. Two others were injured and rushed to a hospital. County commissioner Mohammed Maalim said the miners were trapped at night, and retrieved by residents who heard a strange sound at the site. "It is illegal to mine sand at night. It is even dangerous to access the mines at that hour when it's raining", the country commissioner said. The lorry being used by the miners was impounded by police.(1). This is one more case in a dangerous and damaging trade in sand mining in Makueni county. As reprted by Al-Jazzeera (2), "on an early evening in February, in the quiet trading centre of Mangala, a mob of young men attacked a police officer named Geoffrey Kasyoki. They murdered him for one reason: sand. 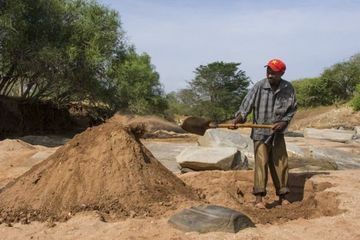 The 38-year-old father of two had been fighting against illegal sand harvesting after operations began in this southern Kenyan county in 2011. He arrested illegal miners working on the riverbeds and spoke to the community about the importance of preserving sand. He became devoted to saving sand when the mining started disrupting people's water supply. The population of nearly one million in this arid, rural county already contends with prolonged droughts. Few perennial rivers run through Makueni. During the rainy season, water seeps into and is stored in the sand of the county's nine seasonal rivers. Residents collect water from holes dug into the sand. But when sand is mined down to the bedrock, the water has nowhere to accumulate. For years, residents harvested sand informally for construction. More recently, as Kenya rapidly develops, demand has surged, not least because of infrastructure works like the SG Railway. "Big businessmen realised they could make a lot of money out of the sand by supplying the bigger construction ventures in Nairobi and in other cities, and that's when the problem started because it was no longer sustainable," says an employee of the nonprofit organisation Kenya Water Partnership. 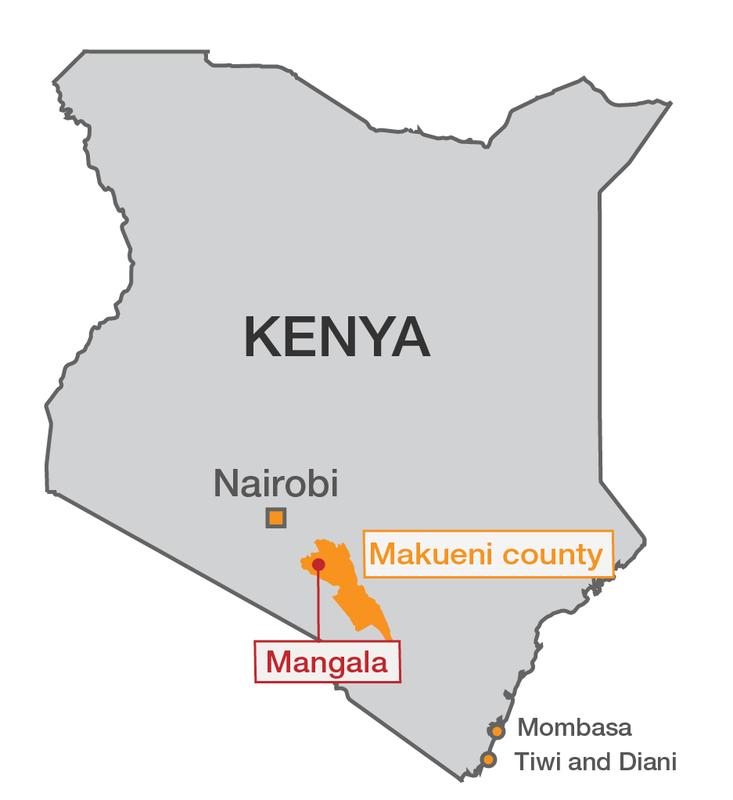 Makueni's residents are now divided between those protecting the sand and those harvesting it for money. In 2015, mining without a county government permit was banned, but illegal harvesters still come day and night. "The sand harvesters chase us so that when the lorries [trucks] come [we cannot] defend them from carrying the sand," Agnes Mumbua, Kasyoki's mother, says. "They burn the houses and we run to the mountains. Then, they start scooping the sand." In the last two years, at least seven people have died in mining accidents or sand-related violence. Clashes involving residents, harvesters, truck drivers who collect sand and county officials have wounded many more. Kasyoki's family say his murder was a warning not to stop the miners." (2). Project Details "If some traders have licences, many do not. Along a riverbed in Makueni, men in faded, ripped shirts spend their days illegally digging sand and flinging it onto piles in the baking midday sun. On an average day, 10 trucks come and go from this stretch of river removing about 100 tonnes of sand. 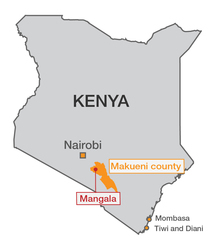 There can be up to 20 mining sites on each of Makueni's rivers.". (2). "The police are are accused of turning their roadblocks into unofficial toll stations for the sand ferrying lorries."(7). Relevant government actors County commissioners. Environmental justice organisations and other supporters Kenya Water Partnership. Other Large scale impacts on river beds. Why? Explain briefly. Sand mining continues despite the ban. Victims are sometimes the miners themselves and sometimes police officers trying to impose the ban. (5) Kenya's illegal sand miners destroy farms to plunder scarce resource. Shadrack Kavilu, 6 October 2016. (3)He who controls the sand: the mining 'mafias' killing each other to build cities. The Guardian. (1) Three killed after sand mine collapses in Makueni. Dec. 19, 2017. By MUTUA KAMETI-. KBC Channel 1, 2015. Sand harvesting has suddenly become a full time business in Makueni County, thanks to the ongoing construction of the Standard Gauge Railway. Young boys and girls are dropping out of school at an alarming rate to join the now lucrative trade. (4) Bob Koigi. DEADLY AND DESTRUCTIVE: KENYA CARTELS FAN SAND WARS. SEPTEMBER 12TH, 2017. (6) Sand harvesting threatens to displace thousands. IRIN news. 2012. On River Nzoia, near Lake Victoria. 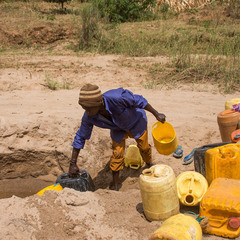 A man collects water on Kikuu River in Makueni. During the dry season, locals dig small wells in the sand like this one to gather water. Irene Nduku Kasyoki holds a photograph of her late husband Geoffrey Kasyoki. His death "pierced my heart," she says. Working on sand. "[The cartels] oppress us," Mutinda says. "They get the money but we do all the work, and put ourselves in danger doing it." Anthony Mua Kimeu looks at the steep cliffs of the A couple of years ago, this river was flat; now the drop from the banks to the riverbed is about ten metres. A sand truck in Makueni. One kilometre of motorway requires 30,000 tonnes of sand, according to the 2013 documentary Sand Wars by Denis Delestrac.Bedrock signals the bottom of Nthange River's riverbed. Without sand to slow it down, rivers can diverge and travel at incredibly fast speeds over the bedrock during the rainy season. Locals describe it as "like a tsunami", which erodes the land and can sweep away people and livestock.